Scotch Plains-Fanwood High School is a comprehensive regional public high school serving the Township of Scotch Plains and the Borough of Fanwood in north central New Jersey, USA. Scotch Plains-Fanwood has an active athletic program. Its Raiders football and soccer teams enjoy back-to-back playing fields with large bleachers, new turf, a common press box and a new audio system covering both fields with Community R-Series loudspeakers. "The old audio system failed on homecoming day in 2012," said contractor Scott Hibbard of Scott Hibbard Audio. "They had no audio for sports announcements or even for emergency paging." After reviewing several proposals, the school selected Scott Hibbard Audio to replace their damaged audio system. Hibbard designed the new system to cover both fields from the common press box. 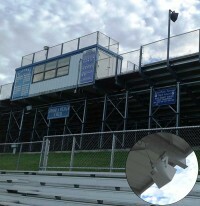 For the football field, he installed four Community R.5-94s for the home-team bleachers and two R.5HPs firing across the field for the visitor seating. 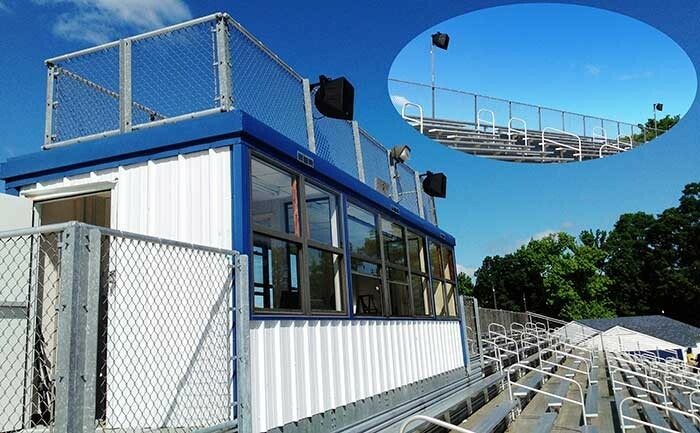 He covered the smaller soccer field bleachers with a pair of Community R.25-94 loudspeakers. The system uses a dbx ZonePRO Digital Zone Processor for system control, mixing and equalization. Hibbard provided a Shure announce microphone and a pair of Shure wireless mics for use on the field. A wall panel provides source selection and volume control. Another wall panel configures the system for football games, soccer or events that utilize both fields simultaneously. For security, both wall panels are located in the equipment rack. The loudspeakers are aimed away from adjacent neighborhoods yet provide excellent coverage with only 3dB to 4dB of variation across the entire field. The system was used in its "both fields" mode for this year’s graduation ceremonies. The school is very pleased with the system’s performance. "The old system had used traditional paging horns and had a narrow frequency response and poor dynamic range," said Hibbard. "The students love the new system and, when the school officials heard it for the first time, their jaws dropped!"